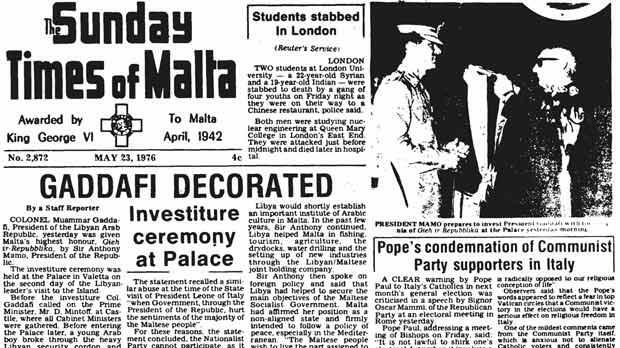 A copy of The Times showing Col Gaddafi being given the honour, and right the colonel being greeted by then President Anthony Mamo. Malta will strip Muammar Gaddafi of the honours it bestowed upon him, as its 42-year relationship with the Libyan dictator is dealt the final blow. In what appears to be a rush for Malta to wipe out its long-term relationship with Col Gaddafi, both the Nationalist government and the Labour opposition are now keen to see his decorations removed. 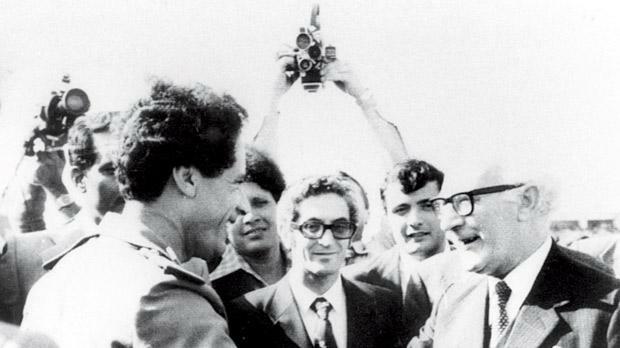 Col. Gaddafi was made an honorary member of the Xirka Ġieħ ir-Republika in 1975 under a Labour government and an honorary companion of the National Order of Merit in 2004 under the Nationalists. The government yesterday said it would present a resolution in Parliament according to the Ġieħ ir-Republika Act, after the summer recess, to strip Col. Gaddafi of his honours. The Labour Party told The Sunday Times it agrees with stripping Col. Gaddafi of the honours conferred to him by Malta. Answering questions sent before the government made its announcement, a Labour spokesman pointed out that honours were awarded under various administrations in government. “That’s why we believe both parties should agree on a joint resolution and move it through Parliament together,” the spokesman said. Back in March, former Nationalist president Frank Portelli and poet Maria Grech Ganado both asked to be removed from Malta’s list of honours until Col. Gaddafi was taken off the list. While the President’s office had said it could only act after a parliamentary resolution, the Labour Party had refrained from making any comment and the PN said it was not an urgent issue. However, the PN yesterday welcomed the government’s decision, which came after another “timely” decision to recognise the Transitional National Council as the government of Libya. The party added that it never held back from condemning the Gaddafi regime for the atrocities it committed. Meanwhile, parliamentary secretary Jason Azzopardi last Friday suggested renaming Gaddafi Gardens in Paola to Libya Gardens. A spokesman for the Office of the Prime Minister said the government agreed with this proposal. The Paola council also gave the thumbs up.